Werner Kuhn fears his Mecklenburg-Wester Pomerania state will be denied access to a 200-mile zone it currently has rights to off the coast of Scotland and north-east England. Ships from the north German state fish about 50,000 tonnes of herring from those waters but are at risk of losing access if Britain leaves the EU without a deal. Those fish are processed at the Euro-Baltic plant in Sassnitz-Mukran in Rügen, an island off Germany’s north coast. However, they are caught in territory which could fall into an “exclusive economic zone” which Britain could exclude German ships from after Brexit day. Mr Kuhn, who is a member of Angela Merkel’s Christian Democratic Union party, told German radio station NDR 1: "If it comes to a hard Brexit at the end of March and the UK leaves the EU without a contract, the British could create an exclusive economic zone around their country. Mr Kuhn’s comments come days after British MEP David Coburn demanded EU fishermen stop “plundering” British waters after Brexit. Mr Coburn said fishing communities voted for Brexit because they want control back after being “stolen” by Europe when Britain joined the EU in 1973. After Brexit, deal or no-deal, Britain will be out of the Common Fisheries Policy, the legislation which currently allows EU fishermen to access UK waters. 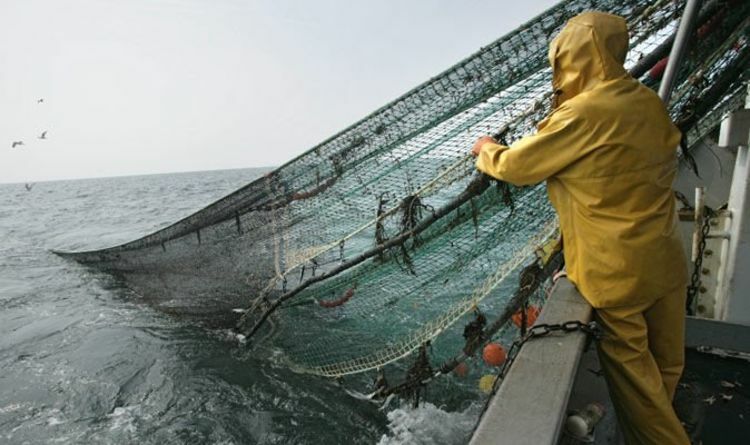 Speaking in the European Parliament last week, Mr Coburn, an independent MEP, said: "Britain wants her fishing grounds back, especially my country, Scotland. "They were stolen from us by the Government and given to the European Union as a prize for entering the European Union in the first place, something that we weren’t told. “We were told it was some sort of trade deal but it turns out it was not a trade deal." "We are now leaving and we want our fishing grounds back. “We’re very happy to sell any amount of our seafood to the Spanish – many of us go on holiday to Spain and we all like out paella. "We are very happy to sell our fish stocks to the European Union but we are not happy to have our seas plundered by the European Union."